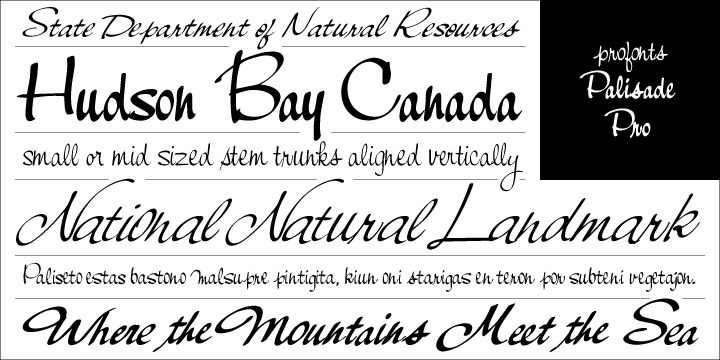 Palisade Pro is a very elegant script family by profonts studio. Each of the eight weights contains approximately 1000 characters. The character range includes the complete Latin layout for Western and Eastern Europe, including the Baltic states, Romania and Turkey. Moreover, the character set contains a large selection of ligatures and alternates, which make this attractive script perfect for OTF-enabled applications. Palisade supports up to 66 different languages such as Spanish, English, Portuguese, French, Turkish, Italian, Polish, Kurdish (Latin), Hungarian, Kazakh (Latin), Czech, Belarusian (Latin), Slovak, Finnish, Danish, Latvian, Irish, Estonian, Basque, and Icelandic in Latin and other scripts.